Did you have me in mind when you designed this template. I love this!! I'm using it as the perfect backdrop for my online soap opera AGAINST THE STORM located at http://againstthestorm.blogspot.com/ if anyone cares to check it out. The ONLY two bugs I found were that the banner isn't centered and the description below the banner isn't even readable (Had to create an ABOUT section in the sidebar to circumvent this). 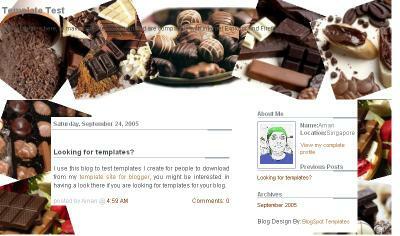 I was pretty impress on your work and I'm just wondering if you could help me since I'm kind a interested to use your Chocolate delight "with your permission of course" for my Food blog but it seems not working though i tried to post it first to my blog then copy the link through my template but one of my biggest problem was not even align or it's way up to the top where my Blog Title was so I'm just wondering if you could help me a little bit just to put them to where people can see the whole pictures of it. I Appreciate your help and here's my email address xtinejensen@gmail.com. Hope to hear from you soon! hi, it's me joan again. I was wondering if you could change the background into a light brown as the white feels a bit blan. aman, when i click "Get Template" it opens a window and it give me the code for the text and the chocolate background. How do i put the chocolate background into my template? Theres no code for it. Please reply ASAP. Thanks so much. hello, the zipped file does not contain the white dot.gif file. could you perhaps send it or upload it? I download the template to my computer and try to upload it in to my photobucket account. It didn't upload at all. Help me pls, I'm very new in this. Oh i love this one, would you please mail me the code? ?